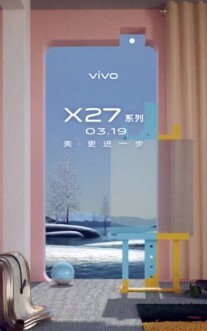 We are going to see the vivo X27 official announcement on March 19, but it will hardly be a surprise. We know the specs from TENAA, the company itself introduced the design on its Weibo page and today it confirmed once again the rising selfie camera in a series of videos on the Chinese social media. Do you see the vivo X27 outline? There are three short 10-second clips, revealing the elevating front-facing shooter in an artistic fashion. 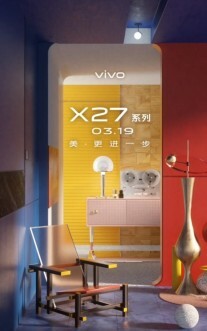 Our tipsters revealed the designer of the vivo X27 said the unusual camera design on the back is made specifically to increase product identification. We can agree it is definitely working, putting aside any subjective matter like aesthetics. Meanwhile someone jumped the gun and delivered a nine-second video of the actual phone. It's of pretty poor quality and doesn't reveal too much, but does give away the interesting finish on the back. 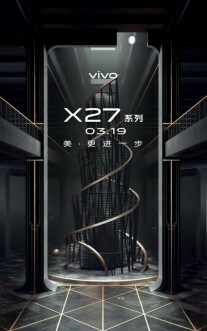 The vivo X27 will arrive in two variants, with the difference likely to happen only in China. One variant will have Snapdragon 675, the other will be running Snapdragon 710. It will have a regular fingerprint scanner on the back, while a vivo X27 Pro will have the UD sensor and improved 32 MP selfie shooter.